Harold Plunkett pauses in the center section of the Collings Foundation B-17 and places his hand on the ball turret gun, suspended in its belly. Kids from the X-Box generation, accustomed to battling imaginary foes in worlds where you can simply hit “reset”, may be forgiven for dismissing the significance of his words. Plunkett, himself a teenager when he signed up, flew over 80 missions as a ball turret gunner in the Second World War, being twice injured within a hair’s breadth of his life by enemy gunfire. But when the old plane’s four 1,200-horsepower Wright “Cyclone” engines fire up and it takes to the skies again, they get it; there was nothing make-believe about this plane, or the bravery of the young men who flew her again and again into the teeth of flak and enemy fighters. For the last 25 years, the Collings Foundation (a 501c3 non-profit) has been touring the United States, preserving the living history of the airplanes that defended our country and the young men and women who flew them. They strive for immersion. Kids don’t just see the planes; they get a sense of what their grandparents did for them. These aren’t “velvet rope” tours, either. Visitors are allowed to climb right inside the foundation’s B-17 and B-24 and crawl around, peering over the pilot’s shoulder into the cockpit, tiptoeing the narrow catwalk over the bomb bay doors, and swiveling the (decommissioned, of course) guns of the waist-gunner positions. 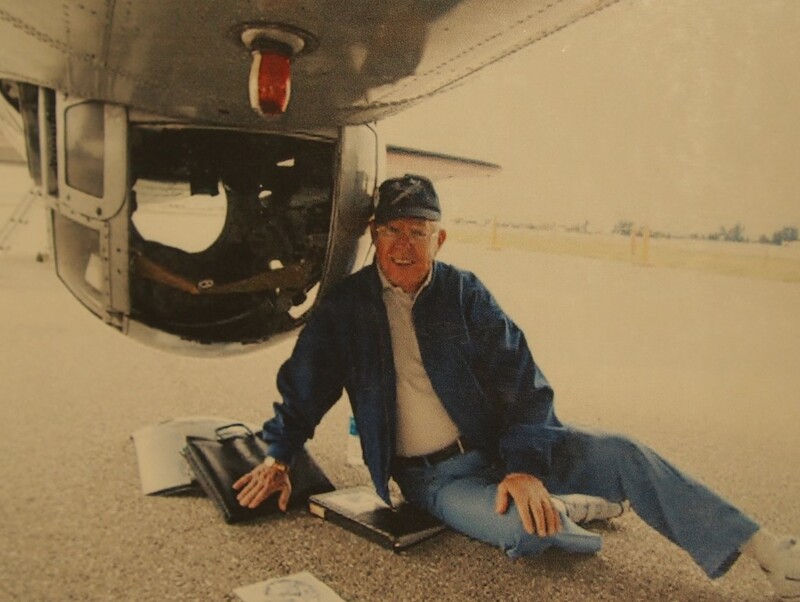 Veteran Harold Plunkett beneath a B-17, the same plane model on which he served as a belly gunner. Collings also offers “flight experiences”: for the cost of a donation that helps keep the planes flying, donors can ride along as the B-17 and B-24 take to the air and get a first-hand sense of what it feels like to be peering out the top hatch of a flying battleship with nothing but air between you and the ground below. Even the most jaded peanuts-and-an-inflight-movie flier will never look at an aircraft overhead the same way again. The Foundation’s “Wings of Freedom” tour spends over ten months each year on - and over - the road, criss-crossing the country, making thousands of flights. But they can only visit so many airports in person, and are constantly searching for ways to share the aircraft with people who can’t see them live. When they heard about Matterport’s scanning technology during a stop in Silicon Valley’s Moffett Airfield, they invited the team out for a first-hand look at the planes. Matt Bell and Daniel Ford took turns building models of the B-17 and B-24 to capture the experience of exploring these two extraordinary planes. Now, from the comfort of your couch, you can peer out over the bombardier’s position and explore the cockpit of a B-17 Flying Fortress, and crawl over the narrow catwalk of the bomb bay to the tail gunner’s turret in the B-24 Liberator - the airplane featured in “Unbroken”. You can get a first-hand view of what American airmen, some still teenagers, saw as they went to war, many never to come back. Matterport’s virtual media platform, and other technologies like it, are quickly changing how we experience our world. Places and objects that were once remote can now be accessed from anywhere. And viewing far-off objects and locations is just the first step toward a future that will be filled with interactive, creative digital experiences that let us engage with--and change--real-world objects on virtual platforms. Imaging these planes was a powerful reminder of the surprising ways that the future of technology may bring us closer to our past, making it more real. Matterport is proud to use their technology to help organizations like the Collings Foundation preserve and share the living history of important pieces of cultural heritage like these irreplaceable aircraft.Special thanks to the Collings Foundation for access to their planes.